Beautiful buttons being packaged up for the shop. I enjoy participating in the antique and collectibles auctions. It was fun furnishing the Convent with quality and distinctive furniture and items of interest as well as finding lovely fittings for the shop which suited the heritage building. A handwritten note accompanying some of our acquired beads. Possibly written in the 70s. Now G and I are searching out interesting items for the shop. 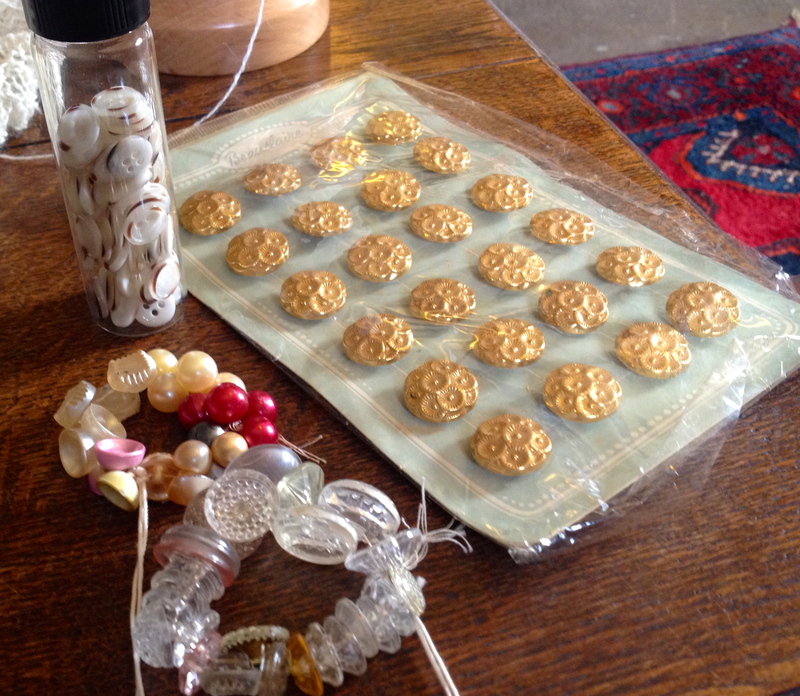 We particularly love finding vintage buttons and other trims which also go hand-in-hand with personally knitted items. 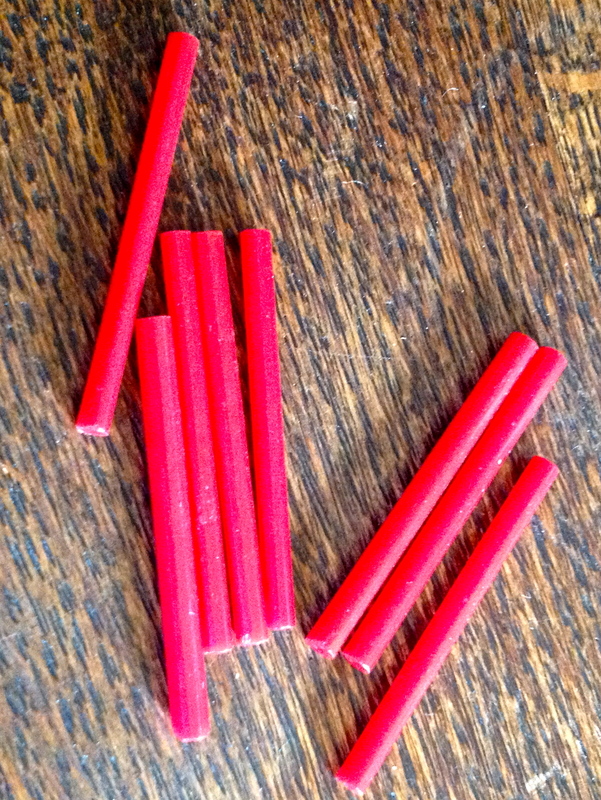 The stunning red glass bugle beads – heavy and you can hear the glass clink! 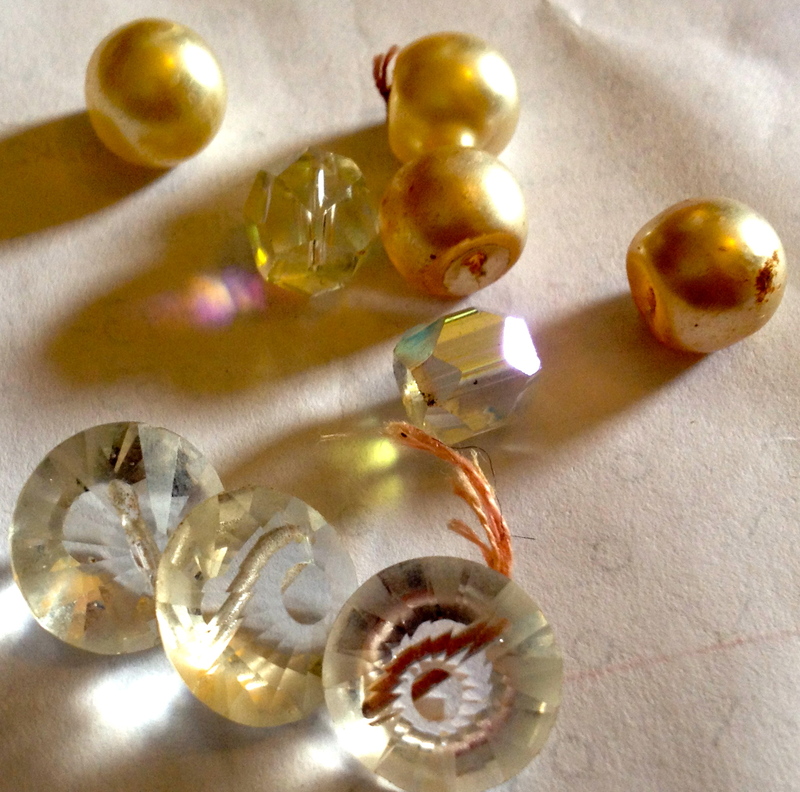 This week I was pouring through a mixed box of buttons I had picked up at a recent auction and was delighted to find a hand-written note in a plastic bag mixed with a few different beads. 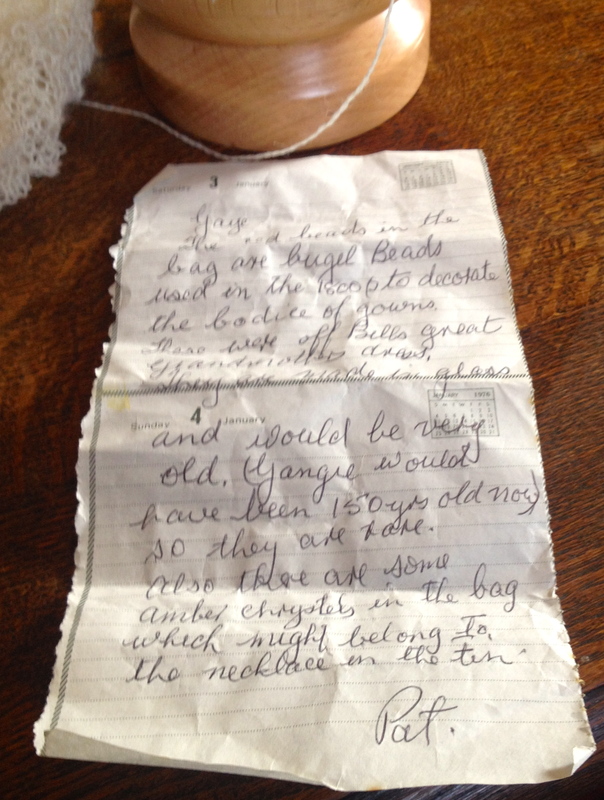 It was exciting to discover that the bag appeared to contain, amongst other things, a note explaining that the red bugle beads had been used in the 1800s to decorate the bodice of gowns and belonged to the note-writer’s husband’s great grandmother’s dress. The great grandmother would have been 150 at the time the note was written and the note was written on a page from a 1976 diary. I’m pretty sure these beads will never make it into the shop for sale and we’re already planning something special in lace to do justice to them. The amber crystals accompanying the bugle beads. 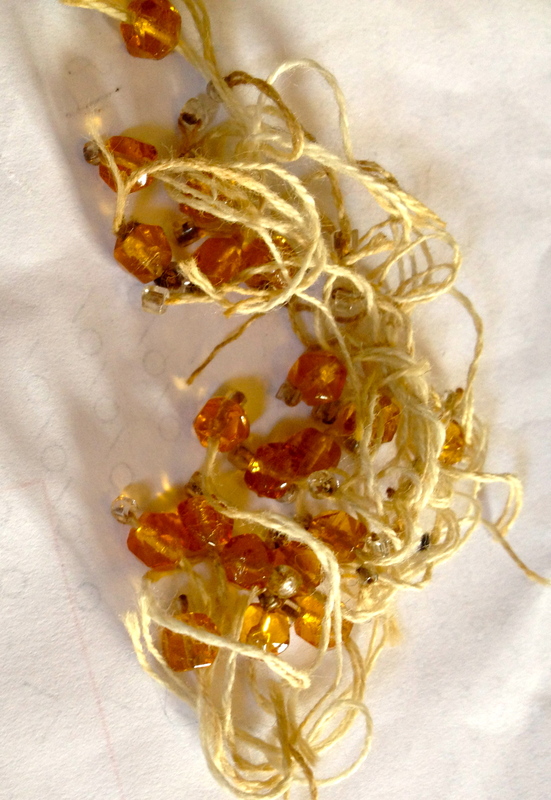 Additionally the writer pointed out that the amber crystals in the bag appeared to be part of a necklace. Anyway, the little bag contained delightful treasures, but none so much as the handwritten note itself. Other pretties in this treasure trove plastic bag. In the meantime, we are having a great time packaging up the various buttons for the shop and imagining some of the garments that might suit these individual buttons and do them justice. 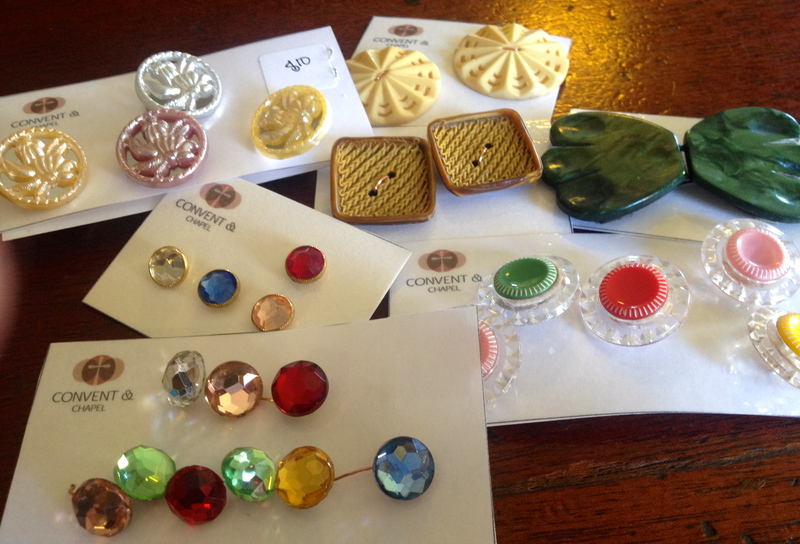 A selection of our vintage buttons. I love vintage buttons! Years ago I bought a bucket full from a second hand shop in Adelaide the man in the shop thought me quite strange I wanted the whole bucket full ( I think various button’jars’ he’d bought amongst things at auction had been emptied into it) I carted it all the way back to Sydney and it made great rainy day entertainment sorting through the contents. Your shop sounds like a wonderful place to visit if I ever get to your neck of the woods! How far from Sydney are you? We’d love to see you. We’re about 3 hours out of Sydney – good roads and two different very scenic routes – Blue Mountains or Bells Line of Road!